Shahrnush Parsipur was born in Tehran in February 17, 1946. She started her literary career when she was sixteen, writing short stories and articles. She graduated from the University of Tehran in Sociology. When she was twenty-eight, she wrote her first novel, Sag va Zememstaneh Boland (The Dog and the Long Winter – translated into Russian). In the same year, while serving as the producer of the Rural Women, a socially inclined weekly program for the National Iranian TV, she resigned from working for that organization, in view of protesting against the meaninglessly cruel torture and execution of two journalist-poet activists by SAVAK. She was imprisoned for a few months, but later, she moved to France to study Chinese Philosophy and Language. There, she wrote her second novel, Majerahayeh Sadeh va Kuchake Ruheh Derakht (Plain and Small Adventures of the Spirit of the Tree) in 1977. Due to the problems associated with the revolution in Iran in 1979, she could not complete her education in France, and had to return to Iran. As a result of a misunderstanding, she ended up in the Islamic Republic of Iran's political prison, for four years and seven months. As soon as she was released from jail, she published her novel Touba va Maanayeh Shab (Touba and the Meaning of Night) which has brought her a lot of fame amongst the book readers in Iran. This book has been translated into German and Italian, and its English translation has published..
As a result of openly referring to the issue of virginity in her novella Women without Men, she ended up in jail again on two different occasions. This book has been translated into English, Swedish, Spanish, Malayalam, Italian, Dutch and French.. In 1992, she was invited to go on a tour around the US, Canada, and several European countries. She spent two months in Iova and participated in Iova Writers Workshop Center. She returned to Iran, but because the publication of all of her books was banned, she came back to the US. Here she received the Hilman-Hammet award, in two occasions. She has received also the honorary tablet of Syrus the Great from encyclopedia Iranica..
She later published a book titled "Prison Memoir" recalling and discussing her memories of jail. Aqle Abi (The Blue Reason) which is a philosophical novel, is another book of hers. She wrote this book in 1989, but it was impossible to publish it in Iran. So She did it in the US and Sweden. 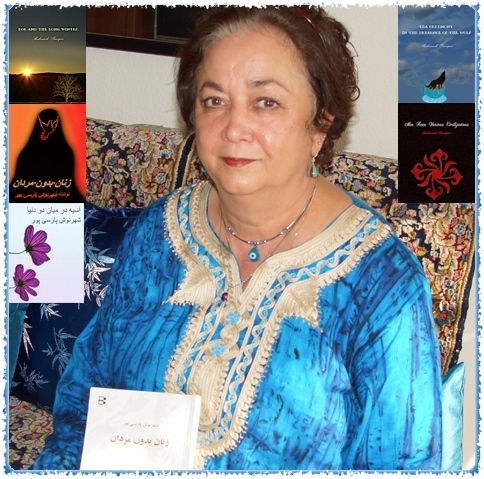 She has written other novels and short stories including Shiva, a science fiction novel [perhaps the first –and only- one of its kind in the Iranian literature]; Bar Baaleh Badd Neshestan (On the Wings of Wind), a novel; Adabeh Sarfeh Chai Dar Hozooreh Gorg (Tea Ceremony in Presence of a Wolf), and Avizeh-hayeh Bolour (Crystalline Pendants), Men From Various Civilization, each a collection of short stories. One of her novella, Tadjrobe-hayeh Azad (Trial Offers), has been published in the Chicago Anthology of Iranian Stories. She has written a lot of articles and has contributed as a critic and essayist in Persian Book Review, and Negin magazines (Los Angeles) as well as Shahrvand journal (Toronto, Canada). She currently lives in the United States of America as a political refugee. Since August 2003, she has received a fellowship of the Brown University for a year, and she lived in Providence, Rhode Island. Shirin Neshat, the prominent photographer and film maker is working on her book, Women Without Men. Two parts of this film have made in Morocco. Because it was impossible to bring the actors and actress from Iran, Shahrnush played in the second part of the film. From June 14, 2006 just June 18, she was invited by East Anglia University in Norwich, England to participate in New Writing Worlds Symposium..
From August 2006, she makes a 14 minutes Literary program and a 10 minutes program about her memoire every week for Radio Zamaneh in Amsterdam. From September 21 just Sept. 24 she participated in The Iranian Constitutional Movement Conference in Maryland University, USA. In October 2006 she went to Seattle as a guest of Iranian Studies of Washington University and had a lecture in Asian Art Museum. In the occasion of publishing of Women Without Men in Dutch language by Bulaaq Uitgeverij she went to Netherlands in October 2006. She has a lecture in Leiden University. Then she went to France to have a lecture in occasion of publishing Women Without Men in French language. In November 2006 she participated in a Seminar in Brown University in Providence, Rhod Island. Orhan Pamuk and Salman Roshdi were the guests of this seminar. in April 2007 she went to England and was the guest of Marion Boyars Publishers that has published English version of Touba and the Meaning of Night. She had 2 lectures in Aqa Khan University and Al Saqi book store. In April 2007 She participated in Passa Porta Symposium in Brussels, Belgium. From April 2007 just the end of June 2007 she was the guest of Heinrich Boell House and had some lectures in different cities. In September 2007 she went to New York to participate in a Symposium. Her host was Malaika Adero. In March 2008, she went to Vienna Austria and had a lectures and book reading in Central Library of this city. At the end of this month she had a lecture for the center of the Iranian women of Vienna. In April 21 2008 she had a lecture that was organized by Women Inc in Amsterdam, The Netherlands. The theme of the evening was female sexuality and lust. Kristien Hemmerecht, the writer from Belgium was one of the participants. In April 25 She participated in the AIDA program in Public Library of Amsterdam. other participants were: Dr Ismail Khoi (England), Qadir Abdollah (Netherlands) and Sudabeh Mohafez (Germany). The reason of this gathering was nomination of Amsterdam as World Book Caspital by UNESCO. In August 2008 a local amateur group directed by Diana Beglow in Port Angeles. Washington state, perfor,med on stage their impression of Woman Without Men. Authored by Shahrnush Parsipur. In February 2008 She went to London, Edinburgh, Stocklholm, Gothenburg. Malmo, Uppsala for a series of lectures. Then she went to Berlin to participate in the conference of Twenty Years After Fall of Wall made by House of World Cultures. In 2009 she published her new book Asieh Between Two World (Asieh dar Miaane 2 donya) by Saaye Publisher in Los Angeles. In Spring 2009 She has a lecture in Stanford University, a lecture in State University in San Francisco and some other cities of the United States. From August 2006 she makes 3 weekly programs for Radio Zamaneh that it's base is in Amsterdam, The Netherlands. She has had sessions in creative writing for four years in Northern California with the Iranian students. Recently she has had another course, but due to Iranian Green Movement this course suspended. In May 2010 She participated in a Forum, made by Praxis Publisher in bologna, Italy. From Spring 2010, The movie, Women Without Men, directed by Shirin Neshat, based on the novel of Shahrnush Parsipur, distributed around the world. This film received the silver lion of Venice Festival in Italy in 2009. From April 25 till May 2011 she participated in World Voices Festival of International Literature, in New York.